Our Price £21.65 Another currency? Bursting with colour photographs, Growing and Knowing Flowering Bulbs has 187 pages of fascinating and helpful facts about flowering bulbs. 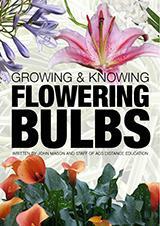 Written by John Mason and Staff of ACS Distance Education, this e-book is a must have for horticultural students, garden designers, professional horticulturists or anyone who is simply passionate about bulbs. Flowering bulbs are grown for use as a cut flower crop and used widely as a garden plant, for borders, bedding displays, in rockeries, meadows,woodlands and even as container plants. Growing and Knowing Flowering Bulbs covers both true bulbs (i.e. Which are made up of scales); as well as corms, rhizomes and tubers which are commonly called bulbs, even though, scientifically speaking, they are not. Bulbs are useful in any garden large or small – even a small balcony garden can have a display of bulbs each year in a single pot. Bulbs help to extend the flowering season or can be used as under-plants with roses or deciduous trees, or slower wakening herbaceous perennials to add interest to the garden in early spring, before leaves appear. Why lift bulbs after flowering?